Mopar®-powered Dodge Charger SRT® Hellcat Funny Car driver “Fast Jack” Beckman reached the semifinals Sunday in the 50th Annual NHRA Gatornationals at Gainesville (Florida) Raceway and now ranks second in the NHRA Mello Yello Funny Car championships standings. Beckman was looking to become the seventh driver to win back-to-back Gatornationals this weekend behind the wheel of his Infinite Hero Dodge Charger SRT Hellcat Funny Car and was joined in Sunday’s second round by four other Charger SRT Hellcat drivers — Matt Hagan, Ron Capps, Tommy Johnson Jr. and Cruz Pedregon. Leah Pritchett raced her Mopar Dodge Top Fuel dragster into the second round as well and holds the second position in the Top Fuel championship standings through the first three events. The run to the semifinals for Beckman began with the 2018 Gatornationals champion defeating reigning NHRA Funny Car world champion J.R. Todd in the opening round. Next, it was an all-SRT Hellcat matchup between Beckman and Johnson Jr.’s Make-A-Wish Charger SRT Hellcat. Johnson defeated John Smith in round one, but Beckman came out on top in round two by 0.0007 seconds (approximately 4 inches). Beckman’s six-round winning streak in Gainesville came to a close versus Tim Wilkerson in the semis. 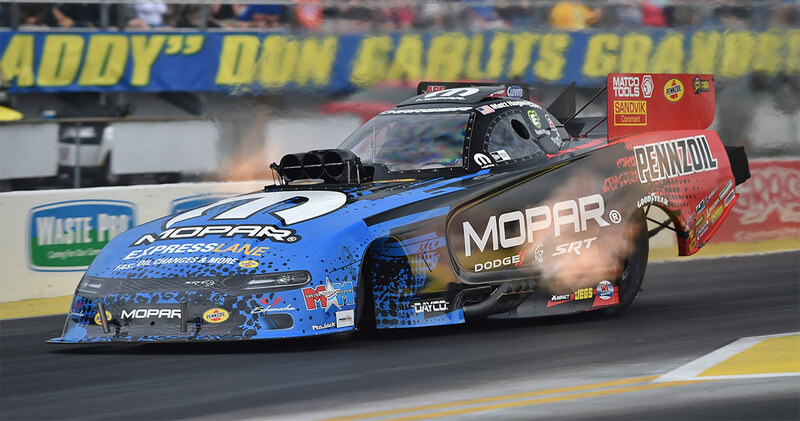 Hagan entered the Gatornationals as the most recent winner in the class and he raced the Mopar Express Lane Dodge Charger SRT Hellcat Funny Car past Jonnie Lindberg in the opening round before losing to John Force. Pedregon was victorious over Shawn Langdon before bowing out to Wilkerson. Capps drove the NAPA Auto Parts Dodge Charger SRT Hellcat to a first-round win over Bob Tasca III before being defeated by Robert Hight. Jim Campbell was the sixth Dodge Charger SRT Hellcat Funny Car driver in competition Sunday and was defeated in the first round by Force. In Top Fuel, Pritchett was looking to become only the third female driver to hoist a Gatornationals Top Fuel Wally and positioned herself by qualifying the Dodge Mopar Top Fuel dragster No. 4 in the field. She was machine-like in her opening round matchup with Pat Dakin, but was defeated by eventual Gatornationals Top Fuel champion Richie Crampton on a hole shot in round two. The 50th anniversary of the NHRA Gatornationals did not disappoint. The DSR crew will be taking lessons learned from this race to fine-tune their game for the next matchup at the NHRA Four-Wide Nationals in Las Vegas April 4-7.